We have thousands of stories that have poured in of people who are thinking differently and dreaming again after reading my daily quotes on social media. This book is your manual for a better life. BEING MORE starts with looking up to strengthen your relationship with God and then ripples outward. Think of this as a series of moments with you and God together, and you are taking into the world what you receive. The book is broken into five parts that focus on the different areas of our lives where we encounter disappointments, frustrations, and setbacks. When one is “out of balance, others begin to suffer. If we aren’t listening to God, the negative messages that flood our minds distract us from what we know is true. When we place too much value on what others have, we become dissatisfied with our own gifts and blessings. As you go through this journey, you are going to discover how to BE MORE connected to God, to BE MORE in tune with yourself, to BE MORE attentive to your relationships, to BE MORE engaged with your community, and to BE MORE mindful of your world. #BEMORE is designed to be carried with you so you can read a section when you are in need of direction or inspiration. Each secret closes with a Tweetable phrase so you can share inspiration with others. Put this book on your coffee table. Hide it in your purse. When you set on this path to BE MORE, you can live an incredible life, even in the challenges, even in the small simple things. I GUARANTEE YOU . . . you will have a better life and it is EASIER than you think! I can’t tell you how many times God has touched me with simply one sentence from this book and Sandi’s “Be More” confessions. This is a book you can read and read again. Enough truth and nuggets of wisdom to help you through life’s struggles. You can read one chapter a day and I guarantee it will change your focus for the day. 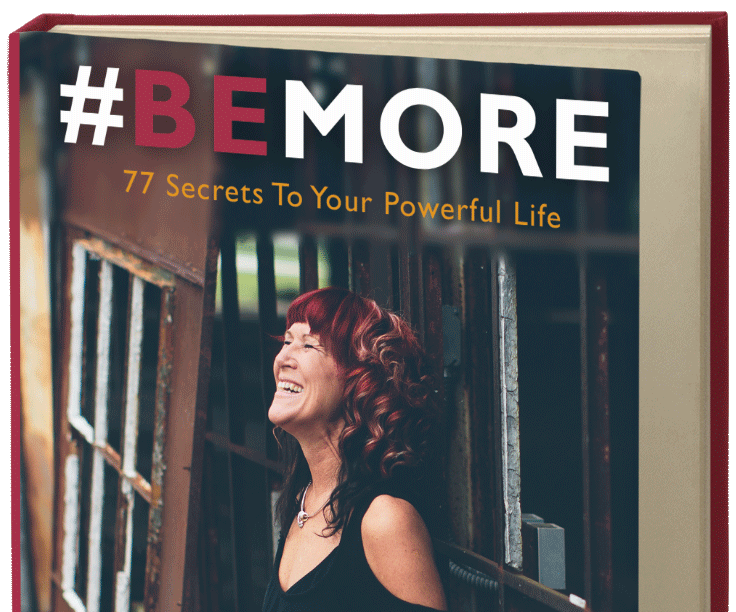 Sandi is a phenomenal leader and her book #BeMore does not disappoint! Her writing exudes peace and her message does a great job of simplifying life. Sometimes life feels so complicated and everything feels like its against us. In BeMore, Sandi shares her best secrets to creating happiness and living a life beyond imagination. If you have doubts about yourself, if you’re struggling to make it through the day without fear or anxiety, if you need a guide telling you how to live life to the fullest, YOU NEED THIS BOOK! These 77 secrets will blow you away when you implement them into your daily life! Seriously!! This book is filled with the encouragement and truth that we all need to rise up and live the powerful life that we’ve spent way too long ignoring. It’s easy to read in one sitting or can be taken in bite-sized pieces like a 77 day devotional. Anyone who wants to finish 2014 strong NEEDS this book! It’s one I will refer to again and again and again. Thank you Sandi for sharing these powerful truths so the world can rise up and #BEMORE. I’m in the process of reading BE MORE and I have to admit it really is easy to get lost in. I love Sandi’s easy style of writing. She draws you in with stories and encouragement that make you want more. I would highly recommend this book to anyone needing a boost, a lift or inspiration in what they are doing. BE MORE lives up to it’s cover promise to help you be more of what makes you the best of yourself. It was so much more than I ever thought it would be, simply amazing. I haven’t finished a book that fast in a long time or really just since having kids. Truly 77 tools to live by. Truths to apply to your life daily, that will help you evaluate where you are and propel you to #BE MORE. It’s for anyone that desires to live up their potential and be more. You can’t read it and not desire more for your life. Your passion and enthusiasm jump off the pages. And the best part for me, that you point your reader heaven-ward for never ending inspiration and ultimate hope. BEMORE takes the reader thru a new way of seeing everyday life. Whether read from beginning to end in one sitting or simply looking for sound instruction on a specific life topic, this book has what you need. What makes this book unique from so many others is not only the pure uplifting words that speak life and bring light to hurting or darkened hearts, but that each section speaks to a situation going on in a person’s life right now. It is not a book about the past. It’s a book about moving forward and being more right now. It is applicable to anyone at any time in their lives, and it contains powerful yet kind words of motivation most people are unlikely to hear unless they read this book. This book has taught me many new ways to make positive changes in my life. Sandi is very truthful with her life experiences with God and teaches us how to have the same experiences. #BE MORE is a highly recommended quick and easy read that anyone can relate to. 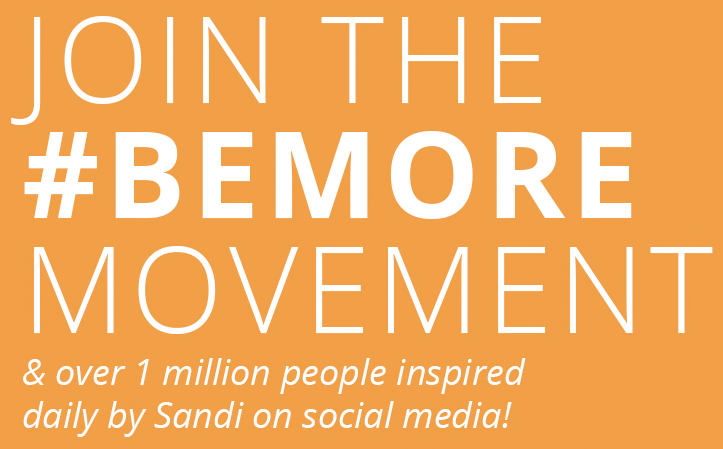 The BE MORE Movement was started as Sandi Krakowski sat on a beach in Hawaii and began dreaming of a better world where people are no longer focused on what they do, what they have, or where they go. Instead, they would be more concerned with who they become. Through the BE MORE Movement people of every race, creed, nationality, gender, and income bracket become connected because they discover that living a meaningful life is about who we are and not what we do. In these 77 Secrets, Sandi offers you inspiration in her unique and powerful style for becoming more connected to God, more in tune with yourself, more attentive to your relationships, more engaged with your community, and more mindful of your world. Through these moments of insight, you will learn simple truths about trusting your instincts, removing obstacles to success, and understanding the power of the words you speak into your life. You can be all you were meant to be and it is easier than you think! Take the journey to BE MORE in your life. Connect with others in this powerful movement and share what you’ve learned through a #BEMORE tweet to the millions of people who are already seeking a powerful life, an empowered life, and a divine understanding of WHO they will become! Sandi Krakowski is an ‘out of every box’ author and speaker, top social media influencer, thought leader, and culture creator. Her specialty is in faith at work, empowering women, and creating culture and marketing for brands. Krakowski, a woman who started her first multi-million dollar corporation as a young mom, has overcome many of her own obstacles – both personally and professionally. She is the founder and president of her current company, a $20 MILLION dollar empire, A Real Change International, Inc. and Sandpaper Tablet, Inc. Krakowski takes pride in the fact that these companies conduct business in ways that bring faith into the workplace, bringing together happiness, kindness, faith and strategic principles that bring results for business owners and employees. Krakowski has spent more than two decades working successfully in online marketing and business development, A noted Facebook marketing expert, she was named by Forbes as a “Top 20 Online Marketing Influencers of 2014,” “Top 20 Women Social Media Influencer” and a “Top 50 Social Media Power Influencer.” She also writes for Entrepreneur Magazine, has been featured in Forbes, Mashable, American Express OPEN, BeliefNet, She has helped build 11 notable companies by utilizing her experience in eCommerce, Internet marketing, direct response marketing, publishing, book creation, copywriting, sales and management, team development and leadership. In addition to empowering and equipping her online audience, Krakowski enjoys spending time reading books, watching funny movies, eating chocolate, enjoying family and friends and her fur babies. She currently lives in Kansas City, Mo. © 2019 Sandi Krakowski & A Real Change International, Inc.